LOCATION: Selfridge’s Brass Rail, on the ground floor at the back of the food hall. 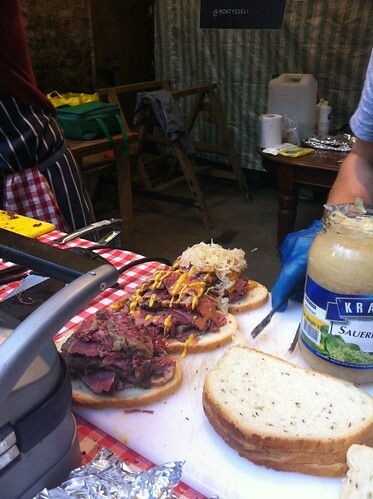 FILLING: 200g of salt beef plus your choice of mustard (I chose American – mistake) and a pickle on the side if you want it (of course you do). PROS: it may cost the bones of £9 but the amount of salt beef is very generous. 200g generous. They slice it and weigh it in front of you, see. I’d say this is the best salt beef I’ve tasted in London so far and the texture was fantastic – incredibly soft and juicy, it just melts in the mouth. Some of the pieces had fat on them which made me feel delirious with happiness. The pickles are ace too – excellent crunch – the sort of crunch that they didn’t even have pre-pickle. Nice and sweet. Perfect. The caraway-seeded rye is dreamy and to be honest, I wouldn’t deviate from rye anyway when it comes to a salt beef ‘wich. CONS: There’s a choice of mustard and I chose wrong because I panicked. While my brain was saying ‘get English, get English, that’s a lot of beef you need the kick’, I made the decision to get American. No. I wanted it to work but it doesn’t have the backbone. Also, £9 is still expensive. BREAD: A massive white sourdough bun of immense crustiness. 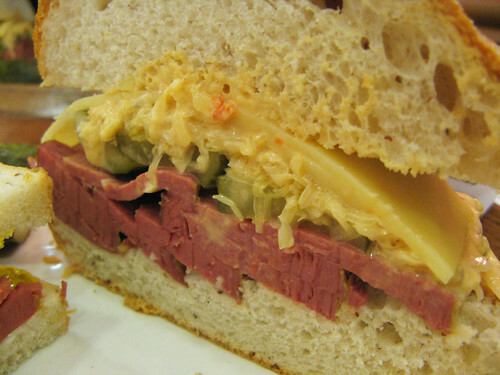 FILLING: Salt beef, sliced pickles, Swiss cheese, Russian dressing and sauerkraut. 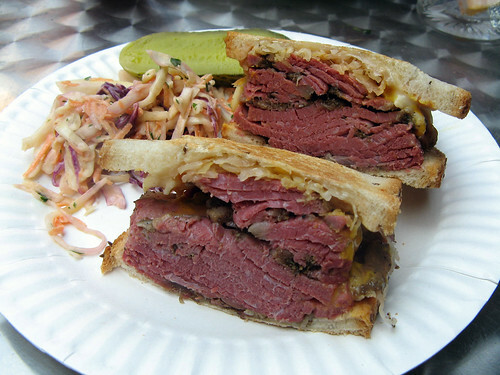 PROS: This is a right beast of a ‘wich and so it should be for FIFTEEN POUNDS. 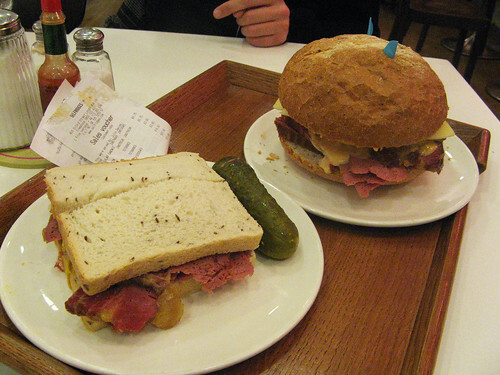 A very generous layer of that wobbly beef again though, and those perfect sweet pickles topped with two slices of Swiss. 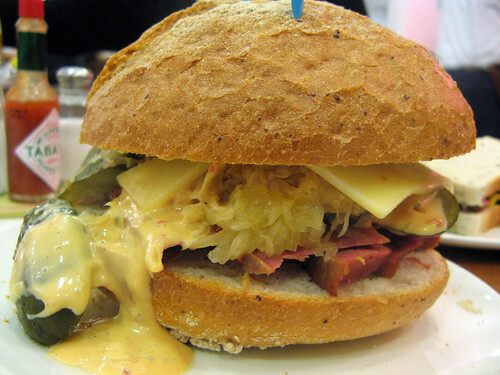 The sauerkraut and dressing smoosh together into a juicy layer of sharp/sweet mush which oozes out all over your hands, your chin, the table. Good stuff. CONS: I know this is Selfridge’s and the sandwich is big but OUCH, that’s expensive. I also think the bread is wrong. I know it needs the structural integrity to hold up under all that filling but it’s just too crusty and it overwhelms the fillings, which frankly, takes some doing. 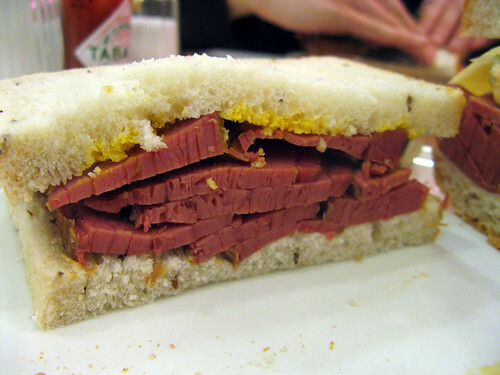 I couldn’t believe my ears but I heard myself saying I preferred the simplicity of the Classic Salt Beef.